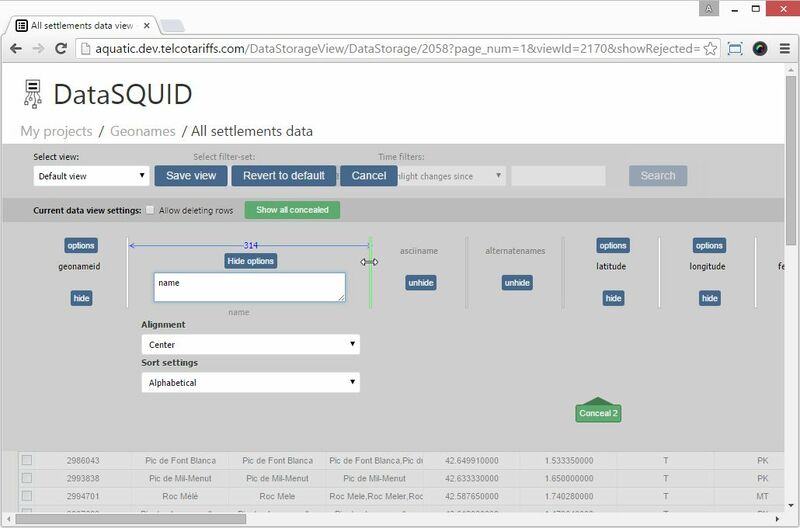 DataSQUID is the easiest way to import, manipulate and distribute data. Your data is held entirely on-premise or in your private cloud. It’s really easy to set up DataSQUID to collect your data, and you can schedule data collection for anything from every few seconds to daily. 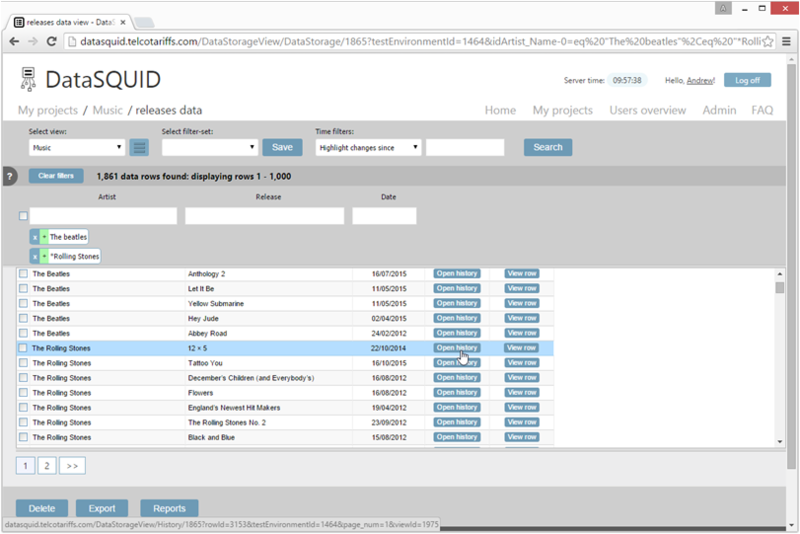 DataSQUID supports data loading from CSV, XML and PDF files (collected by FTP, sFTP, FTPs, drive or from websites), SQL to read data from other databases as well as APIs (SOAP/XML, REST) and inbound emails. We’re working hard to add other data sources including Salesforce and Netsuite. 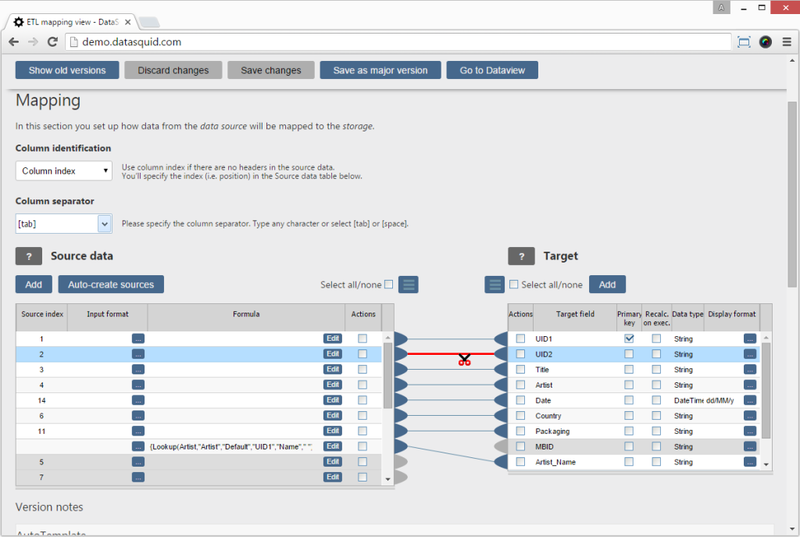 Use DataSQUID’s powerful drag-n-drop GUI to set up how you want your data loaded. DataSQUID’s powerful mapping editor has great features for everything from the simplest to most sophisticated tasks. 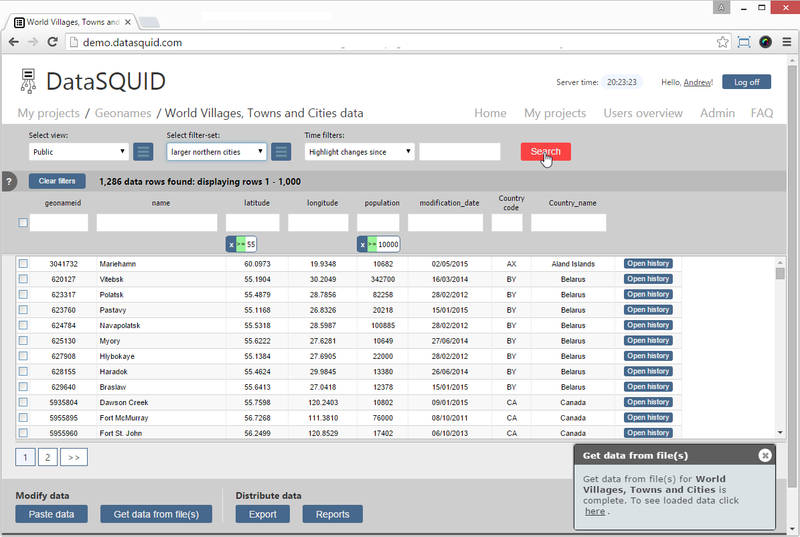 With just 3 clicks, you can set DataSQUID to load all the data from your source. DataSQUID also keeps previous versions of your data mapping templates, so if you break something, you can easily revert to a previous version. 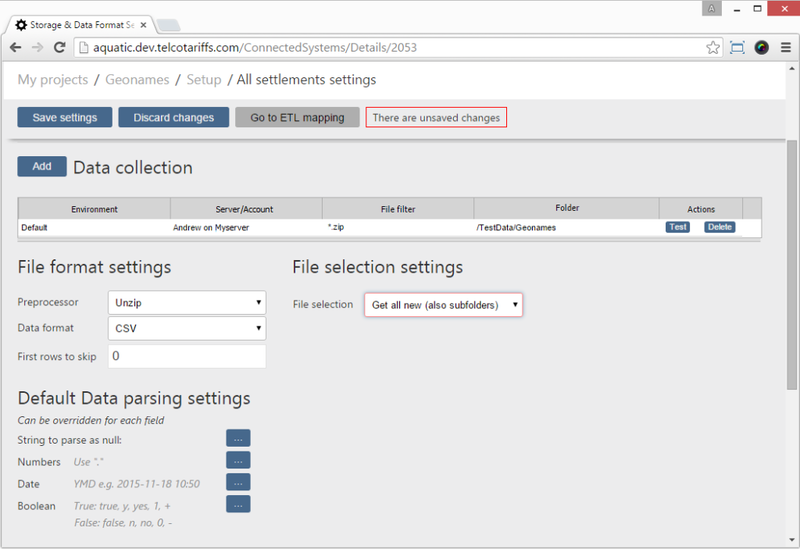 It’s easy to modify your data as it’s loaded into DataSQUID, and just as easy to add additional columns to enrich your data. 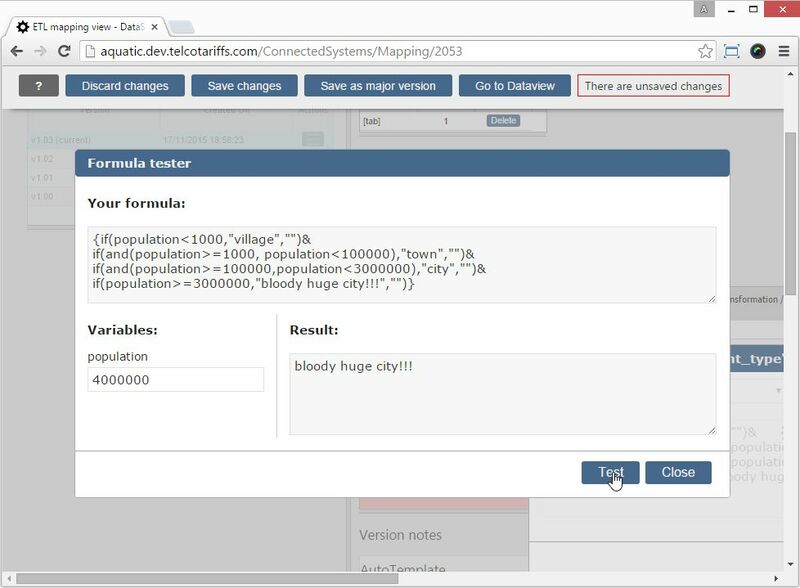 If you’ve ever used Excel to create a formula, you’ll find it very easy to create formulas with DataSQUID. But DataSQUID makes life even easier with a formula tester so you can test every formula without messing up your real data. DataSQUID has a beautiful WYSIWIG editor. Use it to create several views on your data, showing the columns your users really need. You’ll often want to create several views on your data, hiding or showing specific columns and adjusting the column widths. You can even add filters to each data-view, so that the data-view shows exactly the rows that users are interested in. DataSQUID also lets you store a history of all changes made to your data, both in incremental and replacement mode. Replacement mode is used when the data is loaded as snapshots, and DataSQUID creates the history by comparing the entire current data load with the entire previous one. DataSQUID provides convenient GUIs to view changes to the data. We are working hard to add new features including Undo, Snapshot, and Fallback. DataSQUID does not require Microsoft SQL Server CDC features – so this functionality can be used with all SQL Server versions including Express.